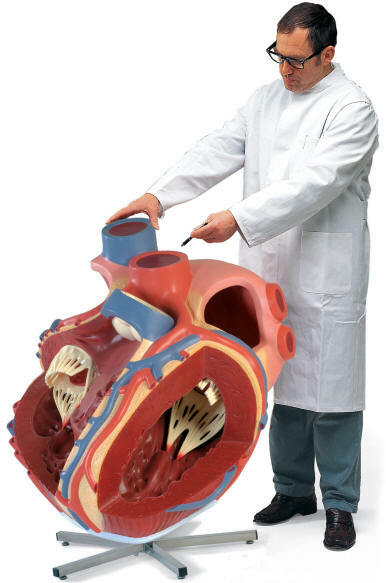 This giant-size anatomical model of the human heart is an enormous eight times life-size. 100 x 90 x 70 cm. Painstakingly constructed by hand, this heart will be the center of attention at any exhibition and is especially suitable for large lecture halls. The atria and ventricles are open to give a view of the interior and show the accurately modeled bicuspid and and major vessels adjacent to the heart as well as the coronary heart vessels. Comes with heavy-duty stand.